Surge Arresters are used to limit voltage surges on an electrical system to level that it can be controlled. It is designed and connected between a conductor of an electrical system and ground to limit the magnitude of transient over voltages on equipment. Surge Arresters are the most commonly used add-on equipment for over voltage protection. It very helpful in limiting over voltage on equipment by discharging or bypassing surge current, prevent continued flow of follow current to ground, and is capable of repeating these functions as specified. WHAT EXACTLY DOES A SURGE ARRESTER DO? 1. Surge Arresters does not absorb the lightning. 2. Surge Arresters does not stop the lightning. 3. Surge Arresters divert the lightning to ground. 4. 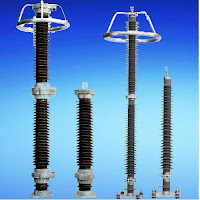 Surge Arresters clamp (limit) the voltage produced by lightning. 5. Surge Arresters equipment electrically in parallel with it. HOW DOES SURGE ARRESTERS WORK? At the heart of all arresters is Metal Oxide Varistors (MOV). The MOV disk is a semiconductor that is sensitive to voltage. At normal voltage, the MOV disk is an insulator and will not conduct current. But at higher (extreme) voltage caused by lightning or any surges, it becomes a conductor. The usual construction of a typical surge arrester consists of disks of zinc oxide material sized in cross-sectional area to provide desired energy discharge capability, and in axial length proportional to the voltage capability. The disks are then placed in porcelain enclosures to provide physical support and heat removal, and sealed for isolation from contamination in the electrical environment. There are four basic types of surge arresters defined by industry standards. The surge arrester type selected for the application depends on the equipment being protected and what level of protection is required. Secondary Type – Available in ratings up to 650 Volts, and are used to protect equipment at the utilization voltage level. Distribution Type – Typically used for the protection of equipment on power distribution circuits. They are available in ratings up to 42 kV. 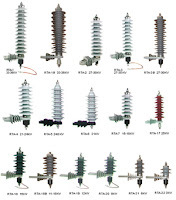 This type of surge arrester is further defined by normal and heavy duty. Intermediate Type – Available in ratings up to 144 kV. This type of surge arrester offers improved protective characteristics and durability. They are generally used for protection of smaller substations, or medium class power equipment. Station Type – Available in ratings up to 466 kV. 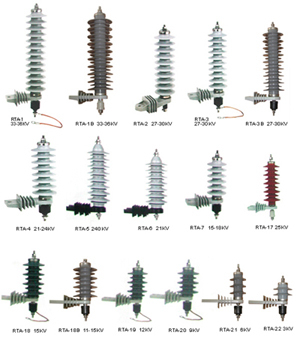 This type of surge arrester offers the best performance among the four. They are typically used to protect substation equipment, rotating machines, or other applications where premium protection is required.